What’s the best healthy habits list? Why are good healthy habits important for my health? Want to improve your health, but feeling overwhelmed? Are you looking for a list of healthy habits worth making? So, you want to get healthy. Many people want better health and to feel good in their body and lose weight, but it seems so hard. You feel like you have to completely overhaul your diet, get rid of all the indulgences, begin a new fitness regime and basically, change your whole life to be healthy. It’s no wonder people struggle with this! Nowhere is this truer than in reference to your health. We make so many small daily decisions that affect our physical bodies; it really is our healthy habits and our routines that determine how our body looks and feels. So, true health comes from small things that we do daily. When we can make these small actions into healthy habits, we will see the change we want to see. 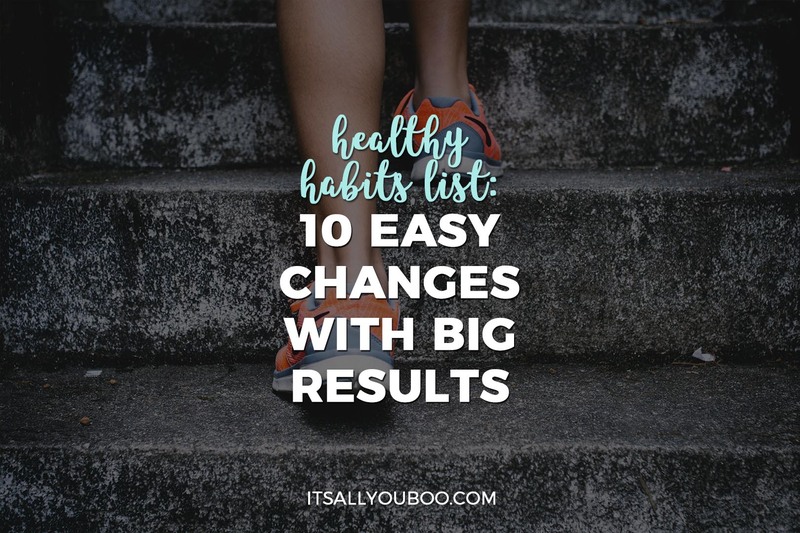 Here’s your healthy habit list, with 10 daily habits that you can incorporate into your life right now, for big life-long results. These small healthy habits are how you reach your health and fitness goals. Research has shown that the number one indicator of health, living without disease, and even weight loss is the number of servings of vegetables a person eats. Pause for a minute and think: How many servings of vegetables did you have today? Yesterday? When you’re counting your vegetables, don’t include starches, like corn and potatoes. Think of non-starchy veggies, like lettuce, spinach, broccoli, mushrooms, etc. Vegetables are loaded with nutrition, vitamins, minerals, and fiber. Vegetables should be the bulk of your diet by volume. So that means, if you look at your plate, vegetables are most of what you see. Eating a large volume of food is going to help you feel full. Never worry about eating too many vegetables. If you’re hungry, eat vegetables! With EVERY meal, start the healthy habit of eating more vegetables! The principle of crowding out. This means simply that you eat so much of the good stuff that you’re not hungry for the bad stuff. The next area where we want to focus on is protein. You want the majority of your protein to come from lean protein sources. That’s not because fat is bad (fat is great), but because fatty foods are actually classified as fats, not as proteins. With each meal, eat a minimum of 20-30 grams of protein. What does that look like? or a serving of salmon, beef, or chicken are a few examples. Why is protein so important for maintaining a healthy body weight? Protein takes a lot of energy to digest. In fact, when we eat protein, the first 30% of calories are burned just digesting it! So, say we had a meal with 300 protein calories. The first 90 calories are used to change the protein to amino acids that our body can digest. Then, the next 33%, or 70 calories of what is left is used converting the protein into glucose that can be used by the cells. Then, if our body needed to convert that to body fat, it would take an additional 25% of the calories to do so. So, more than half of the calories from protein are used up in the digestion process! That means that when you eat 300 calories of protein, only 105.5 of those calories can even be converted to fat because of the physiological processes of getting it to the cells. So, basically, eating enough protein actually helps our body to build lean tissue. Next up are fats. I love my fats! A lot of people are afraid of fats, but don’t be scared! Fats are essential for health. Fats fill you up. They make your skin look good. And, eating fat actually helps you lose weight. Let’s talk about how. Whole food fats fill you up and keep you satisfied. What happens is when we eat whole food fats, we’re giving our bodies nutritious food and we become full–making it hard to overeat. Because this is real food that our bodies can actually use, we have more energy. Without a sufficient quality and quantity of fat in our diet, we will not feel satisfied. Our bodies will keep sending us signals to find more food to satisfy our hunger. So a major role of fats in the diet is to keep us satisfied. In a healthy lifestyle, most of your calories come from fat. That’s good news because fats taste good and make our other food taste good too! You want to focus on whole food fats, meaning, not just oils, but foods with fat in them. However, you still don’t need to be afraid of butter or olive or coconut oil because they can help you eat your vegetables. Not only does that make them taste great, but many vitamins in veggies are also fat-soluble, meaning fats help your body use the vitamins in those vegetables. Jonathan Bailor recommends 3-6 servings of fats per day. For me, I have found that I don’t need to count grams or even servings of fat. Just make sure you’re getting in 10 or more servings of vegetables daily (and remember- the more vegetables=the faster you’ll see results), 20-30 grams of protein at each meal, and then add fats as desired. Move every day. Be active. Find something you enjoy doing. I love yoga and walking with friends. The most beneficial exercise for weight loss is HIIT or lowering heavyweights. The most beneficial exercise for you is the one that you will do! Studies often show that there are different minimum amounts of exercise to see benefits. The big thing to focus on here is to have an active lifestyle. It all counts! Just move your body! Start a healthy habit of movement today. 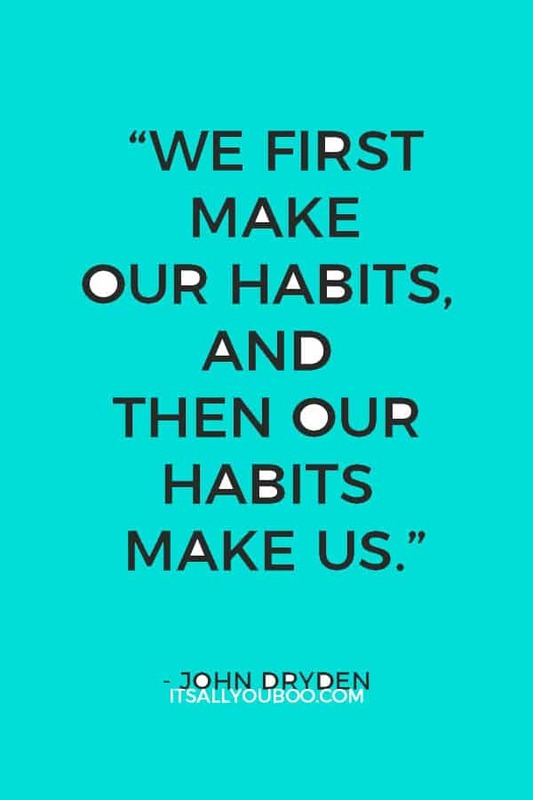 This healthy habit is so important! So many of your body’s processes are regulated by sleep – your energy levels, hunger signals, satiety signals, and mood. Get to bed at a reasonable and consistent time, and wake up at a consistent time in the morning. With all those benefits, sleep is definitely something we need to prioritize! Somethings the healthy habit you can start is shutting it down and just get some sleep. Create a bedtime routine and stick to it. The 80/20 rule gives you permission to let loose a little bit. 80% of your meals are chosen for health, but with the other 20%, give yourself permission to choose for pleasure. This rule means that you don’t have to deprive yourself. You can go out, have fun and enjoy life-all while being healthy and creating the body you want. This is key to being able to stick to healthy habits for life. When we are too strict or rigid with our diet, it becomes really hard to stick to long-term. Make time to do those things that recharge you: hot baths, date nights, massage, prayer and meditation, reading, time with friends–whatever allows you that time to reconnect with who you are and come back to daily life refreshed. Lowering your stress will keep you healthier and happier. An excess of stress negatively affects our health and our weight. When we have an increase of cortisol, often referred to as the stress hormone, we see a corresponding increase in our waist size. Make a healthy habit of taking time to slow down. You will feel so much better. It doesn’t matter how much weight you lose if you don’t feel good about your body. The first step to improving your body image is accepting that you were given this one body. No matter how much you want things to change in it, this is the only body you have. Once you realize that, you start to see things a little bit differently. For me, it wasn’t until I really began to be grateful for my body that I started to see the changes that I wanted to see. I suggest writing in a journal all the things you are thankful for about your body. Say them out loud if it helps. Feeling and expressing gratitude for our body increases our feelings of positive body image. That leads to us wanting to make better choices because we appreciate this body that we have and want to treat it well. Each day take time to make a habit of loving yourself. Real Foods are going to be much simpler. If you’re not sure if something is a real food or not, it can be helpful to read the ingredient list. A long list of unpronounceable ingredients is not easy for your body to digest. Stick to real food most of the time. It’s not difficult to start eating healthy today when you’re focused on real foods. It can help so much to have someone with you as you work toward a healthier lifestyle who has done it themselves and can answer your questions. As a fitness professional and health coach who has worked with hundreds of women, I know the importance of getting help and coaching so you never have to wonder what you should do next. Find a program that helps you take daily steps and creating habits that lead to lifelong health and wellness. Having good, solid nutrition information is a good start- but it’s not enough. You also need practical steps to help you implement what you are learning. 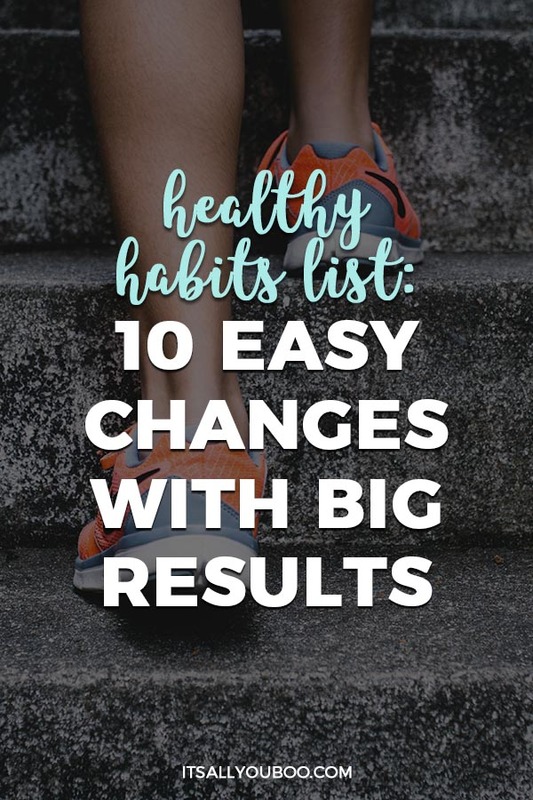 It’s time to pick a new healthy habit from this list and put it into practice. One small change, taken one day at a time for life-long benefits. 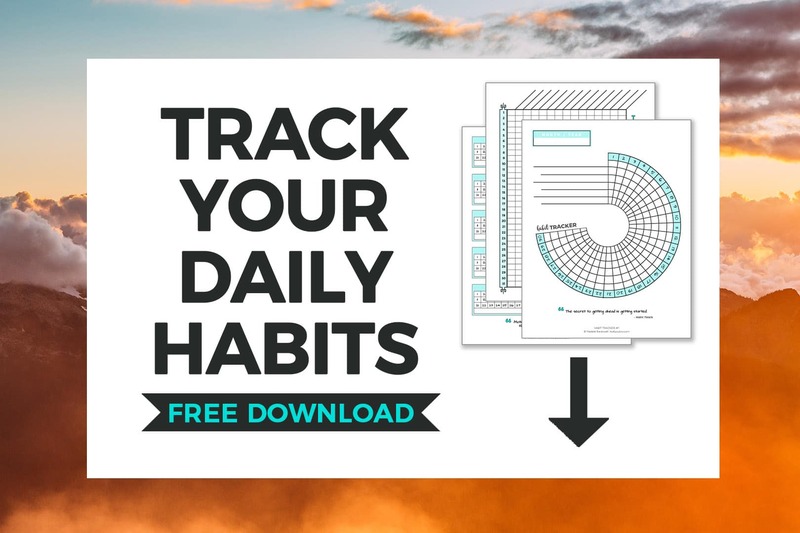 Sign up below to get the FREE Printable Habit Trackers, with pages for 30 and 31 days. What healthy habit from this list will you start? 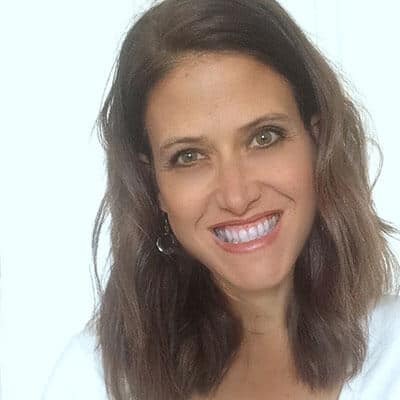 Chanelle Neilson hosts the popular Moms Who Know podcast. She loves helping moms take care of themselves so they can take better care of everyone else. She is the mother of 5 kids and married to her best friend. These are some really good tips. I have just started my fitness journey and I am working towards living a healthy lifestyle. I am definitely going to incorporate some of these in my new routine. I love your blog so much! I always know I can read some next-level inspirational stuff to get me motivated in life! I know so many people will benefit from this post. So many great motivational tips! I think my favorite is the habit tracker. I hope so! Health really doesn’t have to be hard, and the more we understand that the healthier we will all be. Awesome tips. I generally aim for 5 servings of fruit and veggies a day and I’m usually able to hit that number. I’ll have to work on getting more sleep though. The struggle is real. It really is though! That’s awesome you get in your fruits and veggies. And I bet you’d feel even more amazing if you got in more! I love this post. It serves as a reminder for me to eat more healthy. I need to eat a lot more veg than I do now. After reading your blog I got a lot of realizations to myself. From sleeping to the exercise I need. Now I know what’s happening to myself. I’m so glad! It really makes a difference in how you feel. That is powerful to really being able to stick with changes. Great tips! A few months ago I started focusing on drinking more water, upping my protein, and adding more veggies into my diet. I feel so much better and have lost weight in the process. Congrats, I bet that feels good! I love that the things you changed focused on what you are adding to your diet. That is such a great way to make lasting change! These are some wonderful tips for becoming more healthy. It’s easy to get overwhelmed when you start something new, like your diet. I like the idea of the 80-20 rule because you can still indulge every once in awhile. Also, I need to make healthier snacks more readily available instead of all the processed junk in the pantry. Thanks for some motivation! Thanks! The 80/20 rule has been huge for me, because it lets me have a life!! It’s very different than the feeling of being on a diet, you know? It works. Such great tips you shared. I believe in them and practice most of them. Thank you for sharing. So glad you enjoyed it! Best of luck with starting some new healthy habits. Great list! All of these are fundamental, but I’d say number 8 is the most important one—we have to take care of ourselves because it’s the only body we have, not because we want to change it into something else. Yes!! And when we do things that help in the short term and hurt long term, we are not remembering that important truth. I can see why it’s difficult for most people to lose weight. I always put on a tiny bit of weight when I go on holiday and I know I need to lose it. But I never get round to doing it! All awesome tips! I’m glad that I do them all including having a mentor. My highest weight was 230 and I never want to go back there. Mentors and accountability partners keep me on track ! That’s so great. I bet you feel good and look amazing. this is so important especially with our lifestyle today. everything is instant that sometimes we forget being healthy! Yes, and we often want instant results too. These habits are essential to living a healthy and balanced life. As much as I love sleeping, I find that I don’t get nearly as much as I should. Definitely something to work on. Yes, it’s easy to prioritize other things. I love that none of this is about restriction or anything extreme. 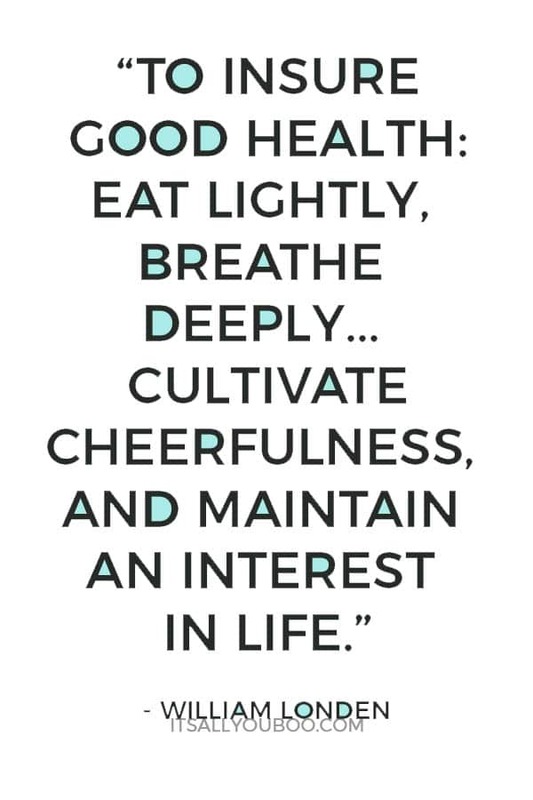 They’re all just really healthy, nourishing habits for all kinds of health (mental, physical, emotional). Absolutely wonderful advice. Also, healthy fats have changed my life. Just sayin! Thank you! It took me a long time to learn that, but really that is what is going to work long term. These are such good and thoughtful tips! I’ve been trying to make it a goal of mine to be healthier and this post really highlights several that I definitely need to incorporate into my lifestyle. Thank you so much for sharing! These are great tips!! I need to improve on all ten but specifically right now I am doing the reduce stress and love my body!! I need to love it no matter the shape. I currently had an injury, so trying to appreciate teh things I still can do, even if i put weight on! Yes, yes, yes! Seriously this might be the most important part. If you start there, I believe everything else will fall into place. Thank you! Gardening has been shown to have lots of health benefits including increased mobility and higher levels of vitamin D! I don’t live near a supermarket so getting vegetables and eating this well sometimes feels impossible. Hopefully soon i’ll be able to move closer to one so I can start picking up these tips! That can make things a challenge. Have you thought about subscribing to a local organic garden delivery? I get fresh organic fruits and veggies delivered right to my door. Doesn’t get any easier than that. You should look into it! Another idea is to use frozen vegetables. They are usually frozen right after they are picked so nutritionally, they are about the same as fresh! You can also save money this way since you don’t have to worry about them going bad. Couldn’t agree more. 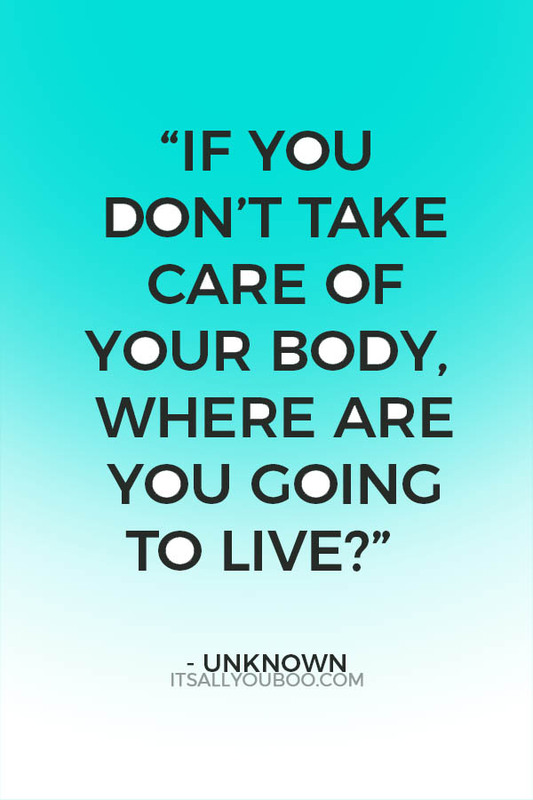 We only have ONE body & we need to realize how important it is to take care of it! I do Orange Theory three times a week. It’s one of my favorites. It’s the best when you have something physical that you love to do! Totally agree with your post we only have one body so why not we take steps towards our healthy body. All healthy tips are good. These tips also help to make our bone strong. It really is! This is something I need to remember when I’m pushing myself too hard.